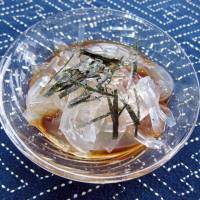 Summertime is the season for cooling jellies, and one of the most popular kinds in Japan is kanten. Overseas, this is known as agar-agar, but here kanten and agar are confusingly considered to be two distinctly different substances. Three types of gelling agents are commonly used in the Japanese kitchen: gelatin, agar and kanten. 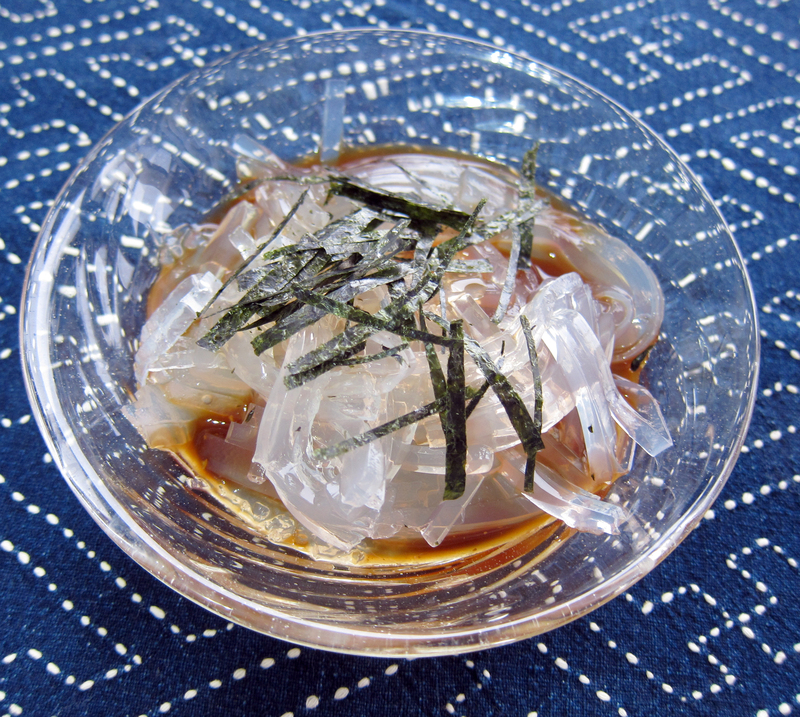 Both agar and kanten are derived from seaweed, and neither, unlike gelatin, will dissolve at room temperature. And since they are both vegetable-based, they are ideal for vegans and vegetarians — unlike gelatin, which is derived from animal-based collagen. The main difference between the two is the texture. 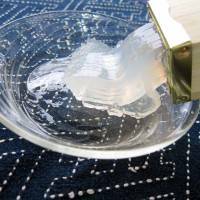 Agar-based jelly has a wobbly, soft, gelatin-like texture and “mouthfeel” — not surprisingly, since it is specifically manufactured to resemble gelatin. Agar is made with carrageenans, a family of polysaccharides derived from various red seaweeds including Irish moss, and locust bean gum, which gives it its texture. 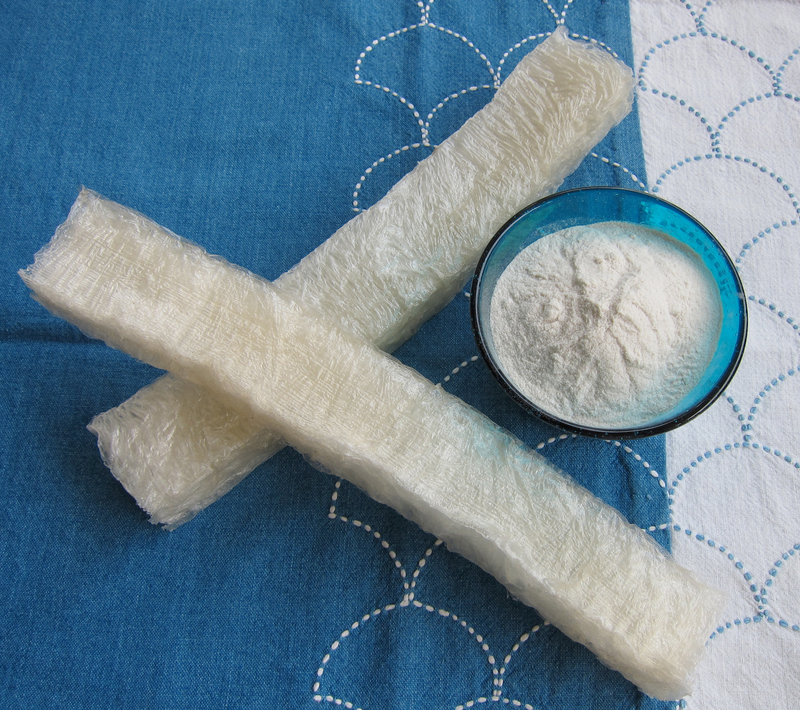 Kanten, on the other hand, only contains a gelling agent derived from tengusa, a specific type of red seaweed. (Less expensive kanten does use other red seaweed such as ogonori, which you may recognize as a garnish for sashimi.) Kanten jelly also has a firm, rather brittle texture that is not like gelatin at all. So it may not be a good idea to substitute agar for kanten when a recipe specifies kanten. Kanten was discovered by accident. In 1685, the proprietor of an inn near Kyoto called Mino Tarozaemon entertained some guests from the powerful Satsuma region with tokoroten, which nowadays is a dish of clear kanten jelly noodles served with a sweet or savory sauce. At the time, tokoroten was made laboriously by soaking, drying and boiling tengusa for days, so it was a luxurious dish reserved for the rich. He’d made so much, though, that the guests could not finish it, so he threw the leftovers outside in the snow. The next day, he discovered that the tokoroten had frozen and turned into a thin, papery, dry substance. This was developed into kanten, which was much easier to use, store and transport than tengusa. Kanten revolutionized the food industry in Japan in much the same way the invention of commercial gelatin did in the west. Tokoroten became cheap enough to be hawked on the streets of old Edo (modern-day Tokyo), and kanten was used to jellify all kinds of sweet and savory dishes. Kanten is available in the traditional block or stick form called bō-kanten, which has changed little since Tarozaemon’s time. It’s also available as a powder and shredded. 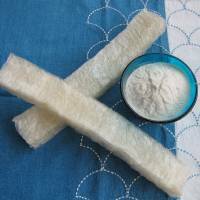 It has virtually no calories and is packed with water-soluble fiber. Tokoroten great fun for kids, and is surprisingly easy to make if you have a traditional gadget called a tentsuki that squeezes the jelly into noodles. Tentsuki are available from around ¥200 for a plastic model on up. 1. Soak the kanten in water for about four hours, until it has softened completely. 2. Squeeze the soaked kanten out lightly and rip it into small pieces. Heat them in a pan with 500 ml of water, stirring constantly. Make sure to scrape the sides occasionally, since kanten may stick. 3. When the kanten has dissolved, strain the liquid into a square container. Leave to cool, then refrigerate until set firm. 4. Cut the set kanten into blocks that will fit inside the box of the tentsuki, and slowly squeeze them through using the pushing stick. Alternatively, cut the block of kanten into thin noodles with a knife. Arrange them into serving bowls. 5. To make the sauce, combine the vinegar and soy sauce/mentsuyu and sugar (adjust the ratio of vinegar and soy sauce to taste) and pour over the noodles. Top with karashi or grated ginger, shredded nori and sesame seeds. Serve chilled.